Your dog will give signs that he needs to go. Puppies are born with an instinct to not defecate where they sleep. But your puppy may not yet be fully in control of his bowels, meaning he has accidents even in his kennel. You can help your dog to stop soiling his kennel by getting him into an elimination routine. Monitor your dog’s elimination habits. Check in on him every half an hour while he is in the kennel. Figure out how long after eating, drinking and waiting he empties his bowels. You may have to put up with a messy kennel for a few more days, but this is the start of solving the problem. Note his behavior before defecating. For example, he may pace around in a circle, whine or paw at the door. Leash him and let him out of the kennel at regular intervals, using your understanding of his elimination habits so you can time it right. Being in the yard can be distracting for him, so use the leash to keep him focused on the task at hand. Don’t let him wander off to investigate the yard. Reward the dog if he eliminates in the designated spot. Give him lots of fuss and praise. If he doesn’t go, put him back in the kennel for five minutes. Repeat the process of letting him out of the kennel until he goes in the yard. If he looks like he wants to eliminate while in the kennel, for example by squatting, open the door and distract him by calling his name, then encourage him to follow you into the yard. If he has an accident, ignore it, clean it up and start the process again. The good thing about training a puppy is that he’ll eliminate more frequently, so you’ll have many opportunities to reinforce correct elimination behavior. 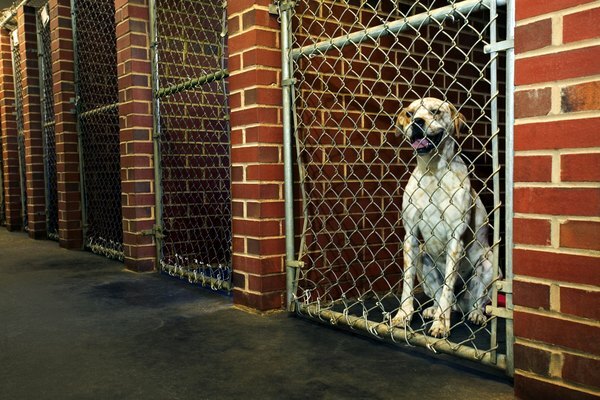 Continue to monitor your puppy in the kennel and let him out when you think he needs to go. Give food rewards and verbal praise each time he goes in the right spot. Over time he’ll learn that when he eliminates in the spot you’ve chosen, good things happen. Don’t punish the puppy if he soils the kennel, as this can make him associate the act of defecating with the negative feelings of being punished and make him anxious about going at all.